Coordinates: 25°02′N 85°25′E﻿ / ﻿25.03, 85.42 Rajgir refers to a city and a notified area in Nalanda district in the Indian state of Bihar. Located at 25.03° N 85.42° E, Rajgir has an average elevation of 73 metres (239 feet). 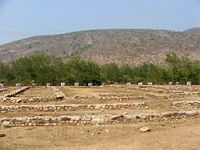 The first capital of the kingdom of Magadha, the city of Rajgir (ancient Rajagriha or Rājagṛha; Pali: Rājagaha), would eventually evolve into the Mauryan Empire. The date of its origin remains unknown, although ceramics dating to about 1000 B.C.E. have been found in the city. Rajgir had served as a capitol city for the kingdom of Magadha for nearly 500 years, including the time of Buddha's life. The city became sacred to the devotees of Buddhism and Jainism; Gautma Buddha performed miracles there, as well as preached some of his most famous sermons there. After Buddha's death, his disciples held their first Buddhist Council in the cave of Saptparni. In a sense, Rajgir could be considered the beginning of the Buddhist movement, coming after the death of Buddha. Mahavira, a key figure in Jainism, spent fourteen years in Rajgir. The epic Mahabharata calls the city Girivraja, recounting the story of its king, Jarasandha, and his battle with the Pandava brothers and their allies Krishna. Buddhist and Jain scriptures mention it, giving a series of place-names, but without geographical context. Historians have attempted to locate those places using the works of Chinese Buddhist pilgrims, particularly Faxian and Xuanzang. The site has been divided into Old and New Rajgir on the basis of Xuanzang, in particular. The former lies within a valley, surrounded by low-lying hills. Defined by an earthen embankment (the Inner Fortification) associated with the Outer Fortification, a complex of cyclopean walls runs (with large breaks) along the crest of the hills. 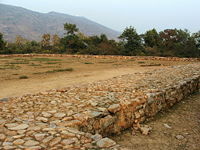 Another, larger, embankment outside the northern entrance of the valley and next to the modern town defines New Rajgir. The sources disagree on which of the Buddha's royal contemporaries, Bimbisara and Ajatashatru, had been responsible for its construction. Ajatashatru has been credited with moving the capital to Pataliputra (modern Patna). This place has been associated with both the historical Buddha and Mahavira. Rajgir has also developed as a health and winter resort due to its warm water ponds. Those baths have been reputed to contain some medicinal properties that help in the cure of many skin diseases. The Ropeway that leads uphill to the Shanti Stupa and Monasteries, built by the Japanese Devotees of the Buddha on top of the Ratnagiri hills have become an added attraction of Rajgir. One may visit Rajgir from Patna. Or the pilgrim may travel by overnight train from Kolkata, traveling by way of Begusarai junction or Mokameh. Rajgir sits off the main road approximately midway along the Barauni and Patna highway. Located in a verdant valley surrounded by rocky hills, Indian Railways has recently inaugurated train service between Rajgir to Kolkata with continuation to Delhi. Rajgir, which means 'house of the king', served as the ancient capital city of the Magadha kings until the fifth century B.C.E. when Ajatashatru moved the capital to Pataliputra. In those days, people called the city Rajgrih, which translates as ‘the home of Royalty’. Jarasandha, who hailed from Rajgrih, had defeated Krishna eighteen times because of which Krishna also has the name 'ranchhod' (person who runs away from fight). Mahabharata recounts a wrestling match between Bhima, one of the pandavas, and Jarasandha, the then king of Rajgir. Jarasandha had been invincible as his body could rejoin any dismembered limbs. According to the legend, Bhim split Jarasandha into two, throwing the two halves facing opposite to each other making rejoining impossible. A famous Jarasandha's Akhara (place where you practice martial arts) operates on the location. The Sattapanni or Sattaparni Cave, on one of the hills around Rajgir, Bihar, India. It was where the First Buddhist Council took place, in the year after Buddha's passing away (Parinirvana). The founders of the religions of Buddhism and Jainism both hold Rajgir sacred. Gautam Buddha spent several months meditating, and preaching at Griddhkuta, (‘Hill of the Vultures'). He delivered some of his famous sermons and converted King Bimbisara of Magadha and countless others to his religion in the city. Rajgir earned fame for its association with Shishunaga Kings Bimbisara and Ajatashatru. Ajatashatru had kept his father Bimbsara in captivitiy here. 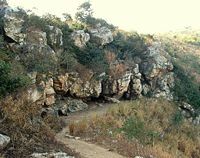 The cave of Saptparni where the First Buddhist Council, under the leadership of Maha Kassapa, had been held on one of the hills. The Saptparni cave serves as the source of the Rajgir Hot Water Springs that have curative properties, sacred to the Hindus, Buddhists and Jains. Today an aerial ropeway provides the link with a hilltop stupa "Peace Pagoda" built by Japanese devotees. Lord Mahavira spent fourteen years of his life at Rajgir and Nalanda, spending chaturmas (i.e., four months of the rainy season) at a single place in Rajgir (Rajgruhi) and the rest of the time in the places in the vicinity. The city served as the capital of his favorite shishya (follower), king Shrenik. Rajgir maintains an eminent place as a sacred site for the Jains. Vulture's Peak, view from a nearby hill. 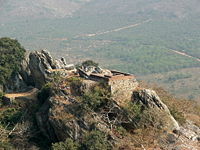 Buddhist canonical texts lists the hill as one of the places Buddha stayed while in Rajgir; and several notable events, including an attempt on his life by his evil cousin Devadatta occurred there. The Mahayana tradition goes further; a number of its major texts, most famously the Lotus Sutra, allegedly had been delivered as sermons there. As such, it is a vital destination for pilgrims in both ancient and modern times. Described both by Faxian and Xuanzang, archeologists in the later nineteenth century identified the site as a hill lying to the east of Old Rajgirin. Japanese devotees have crowned the hill with Shanti Stupa, maintaining a chairlift to the top. A place mentioned in the Pali Canon, where records state Maha Kassapa stayed a few times when ill. Maha Kassappa stayed at the cave; a house with the same name had been nearby. Bimbisara gave a bamboo grove (Venuvana) to Lord Buddha, the first Buddhist monastery ever. Bimbisara gave the grove to Buddha so that he and his monks could take rest here, and give discourses to people. Also at Venuvana are: Karand Tank, Maniyar Math, Swarnabhandar Cave, Pippala Cave, Viswa Shanti Stupa, the famous Hot Water Springs and ruins of an Old Fort with 40 km long and 12 ft wide 2,500 year old cyclopean walls. Remains of the monastery called Jivakambavana. Jivaka, the greatest physician of Buddha's time, hailed from Rajgir. He donated a monastery to Buddha, called the Jivakarama. The Tapodarama Monastery had been located on the site of the hot springs. A Hindu temple sits there now, called the Lakshmi Narayan Mandir. In ancient times, the hot springs used to be the site of the Tapodarama, a Buddhist monastery at the time of Gautama Buddha. Also King Bimbisara bathed there sometimes. The First Buddhist Council, held under the leadership of Maha Kassapa, took place at the cave of Saptparni. Buddha sometimes stayed there; visiting monks resided there as well. Hindu Devotees bathing in the Lakshmi Narayan Mandir. The great albeit evil warrior whose relentless attacks on Mathura prompted Lord Krishna to migrate the populace of Mathura to Dwarika, used to practice martial arts here every day. 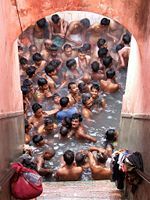 The pink-hued Hindu temple called the Lakshmi Narayan Mandir has within its grounds the ancient hot springs. Worshipers dedicated the temple, to Lord Vishnu and his consort, Goddess Lakshmi, as the name indicates. In more ancient times, the hot springs had been the site of the Tapodarama, a Buddhist monastery at the time of Gautama Buddha. Also King Bimbisara used to take his bath there occasionally. Originally, pilgrims could experience the hotsprings only by taking a dip in the pond. Recently, the spring has been tapped at a higher level, allowing water to flow through several ceramic pipes into an indoor pool where people sit together enjoying the water cascading over them. Unfortunately, the Hindu caretakers prohibit Muslims from using the hot spring bath. Ajatasatru (Ajatasattu) stupa at Rajgir, India, said to contain Buddha's ashes. The Karnada Tank where Lord Buddha used to bathe. The Maniyar Math that dates from the first century C.E. The Maraka Kukshi where the still unborn Ajatashatru was cursed as a patricide. The Rannbhumi where Bhima and Jarasandh fought one of the Mahabharat battles. Ruins of an Old Fort. 40 km long and 12 ft wide 2500 year old Cyclopean walls. Many pilgrims visit the Chariot Route and shell inscriptions, marveling at the uniqueness of the phenomenon. The chariot tracks consist of two parallel furrows cut deep into the rock for about thirty feet, possibly by the large number of chariots that came to deliver goods to Rajgir. Locals believe the ruts had been "burnt" into the rock by the speed and power of Lord Krishna's chariot when he entered the city of Rajgir during the epic Mahabharata times. Several shell inscriptions, the un-deciphered characters current in central and eastern India from the first to the fifth centuries C.E., had been engraved in the rock around the chariot marks. In the middle of the valley sits the ruin of a circular structure with turrets at each corner. Bimbisara had been imprisoned by his son Ajatashatru, but could continue to see Gridhakuta and the Buddha through a window. The fact that the hill can be seen from the structure, and its military appearance, led to its present label after being discovered in 1914. It could also be (because of its shape and the turrets) a Buddhist monastery of the first millennium C.E. Air: Patna (107 km) represents the nearest airport. Rail: Rajgir connects with Patna by rail. Road: Roads connect Rajgir to Patna, Gaya, Delhi and Calcutta. The Bihar State Tourism Development Corporation organizes trips to Rajgir, and Nalanda from its headquarter (i.e., Tourist Bhawan, Beer Chand Patel Path Patna 800001. Tel: 0612-225411, FAX: 0612-236218). Seats on Air Conditioned and Non-Air Conditioned cars, mini deluxe coaches, and deluxe coaches may be hired. 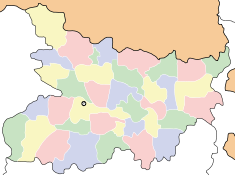 As of 2001 India census, Rajgir had a population of 33,691. Males constitute 53 percent of the population and females 47 percent. Rajgir has an average literacy rate of 52 percent, lower than the national average of 59.5 percent: male literacy 61 percent, and female literacy 41 percent. 19 percent of the population have been reported under six years of age. Buddha-image at Venuvana, Rajir, Bihar, India. This page was last modified on 24 June 2015, at 22:18.